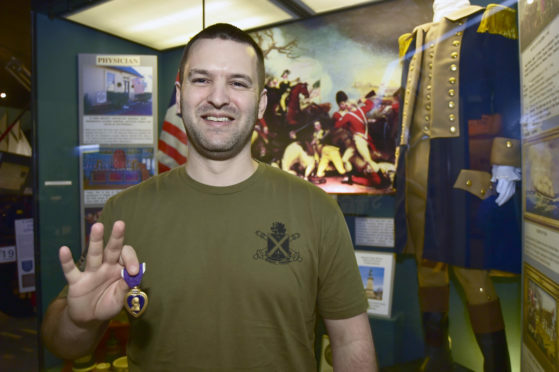 An American army sergeant, who is the great-great-great-great-great-great grandson of American revolutionary war hero General Hugh Mercer has visited the latter’s home town in the north-east. Mercer, who was one of George Washington’s greatest generals almost 250 years ago, originally hailed from Rosehearty, near Fraserburgh. And an exhibit in Fraserburgh Heritage Centre attracted one of his ancestors to the area yesterday. Sergeant Chris Mercer Lowe, known as Kit, was awarded the Bronze Star with Valour for saving a fellow soldier’s life while serving in Afghanistan in 2009. The deadly firefight badly wounded Mr Lowe’s leg, but he has now offered the centre his award to go alongside the exhibit they had for General Mercer. Mr Lowe said: “My visit has been very good – the weather has been better here than home so far. “I think it’s amazing. Growing up, I heard very little about my ancestors and when I joined the army they ran an article about it and I looked more into it. “It was interesting to see how much information they have about him. “I’ve learned more about him from coming to the heritage centre. “There’s a couple of books about my ancestor but they are old and most people who know about him just know of him in Princeton and he was dead years before the war ended. Robbie Watt from the Fraserburgh Heritage Centre who was showing Mr Lowe around said: “Two years ago, we put together an exhibition on General Hugh Mercer who was from Rosehearty. “Had he not been killed in the Battle of Princeton in 1777, he may have been greater than George Washington. “Kit saw it on the website and there was quite a lot of communication and now he is visiting today.